Squamous cell skin cancer (SCC) is the second most common type of skin cancer and accounts for approximately 350 deaths in Australia each year. Unlike Basal Cell Skin Cancer it has the ability to spread to other parts of the body particularly via the lymphatic system. Insitu SCC or as it is sometimes referred to as “Bowen’s Disease” is usually seen as a red scaly patch or patches. It is a superficial tumour and is confined to the outer layer of the skin (epidermis). This lesion cannot spread but can transform to invasive SCC. Frequently Bowen’s Disease can be treated with superficial surgical techniques, cryotherapy, creams, and phototherapy. (dermis). Treatment of these is surgical removal. areas. It causes local destruction of tissue. Treatment is surgical removal. 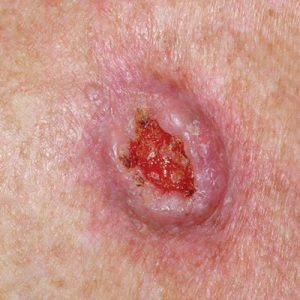 Invasive SCC appear as thick crusty lesions which may ulcerate and penetrate in to the deeper layer of the skin. Spindle cell and poorly differentiated SCC are the most dangerous forms and are most likely to spread. Treatment is surgical removal with a wide margin of normal skin. Solar keratosis (or sunspots) are a marker for solar damage in individuals who are likely to develop SCC. Some SCC will transform from these superficial lesions. Solar keratosis can be treated by a variety of methods including cryotherapy, creams and phototherapy.